matching transmitter output circuits. Receivers have high impedance broadband input circuits and donʼt have this requirement. “Limited Space High Performance Antennas”. same power rated components as the ham radio models. Please study the graphics on FIGURES 1 and 2, and read the written instructions for the installation procedure before beginning your assembly and installation. 40 ft. long. It is for restricted space applications and covers 90 through 13 meters, with the same performance across those ranges as the longer Model DX-SWL. 2. Refer to FIG. 1. For tower leg or mast mounting, the aluminum mounting bracket will have to be drilled to accept a U-Bolt, user supplied. One hole already exists on the mounting bracket. For other installation types, simply attach a rope through the existing bracket hole, with the other end of the rope attached to your mounting point. 3. Refer to FIG. 2. Installation heights ranging from about 20-40 ft. on the high end and about 8-10 ft. on the low end all seem to work quite well since these heights take advantage of a ground (earth) capacitive loading effect which provides broad-banding, and essentially an omni-directional pattern. 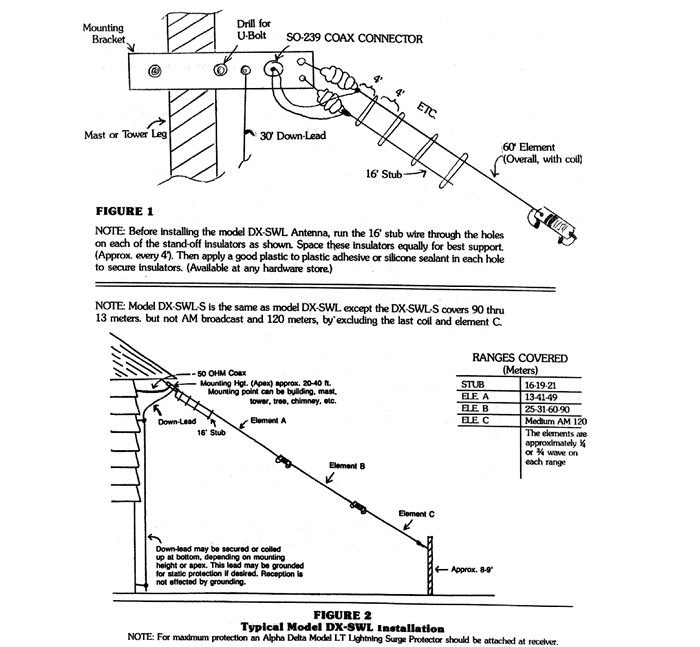 As a result, you can run the antenna wire down slope in any direction convenient to the installation site. These heights and the slope shown provide excellent reception characteristics across the HF shortwave spectrum. The slope angle should be from about 45 to 60 degrees for best performance. 4. Arrange the sloper antenna so it will not be in close proximity to any guy wires, metal gutters, roof tops, other wire antennas or aluminum house fascia. A separation of at least 10 feet is preferred. The antenna should not be closer than 30 ft. from any utility or drop lines. THINK SAFETY FIRST! 5. Attach your user supplied 50 ohm coax feed line (RG-58, RG-8X or similar) PL-259 male plug to the SO-239 connector on the sloper mounting bracket. This connection and the solder connections on the rear of the SO-239 should be sealed with a good weatherproofing agent like “COAX SEAL (tm)”, available at most ham/shortwave dealers. The attached 30 ft. “down lead” wire should be run down from the sloper bracket toward the ground as straight as possible. It should never be left coiled up. 6. Tying the lower tip end of the sloper antenna wire should be done to allow a gentle “bow” or slope to the wire. Do not over tighten or stress the wire. A taught straight wire is NOT necessary for good performance and can over stress the antenna components and coils. RF waves do not “see” the difference! A custom designed end insulator and special low stretch rope have been provided for use at the sloper end. 7. The “ISO-RES” (tm) coils have been coated at the factory with a special UV protectant material and no other coating material is necessary or recommended. Remove any protective packing material from the coils before use. 8. 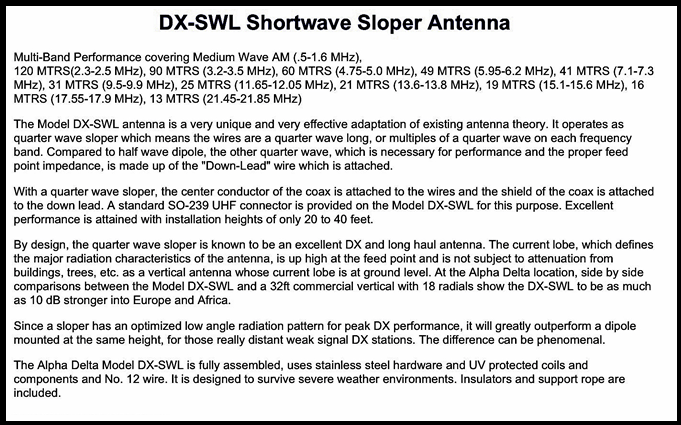 This completes the installation of your new Alpha Delta shortwave sloper antenna. Have fun and listen to great DX provided by these efficiently designed antennas. All Alpha Delta antennas are manufactured in our ISO-9001 certified manufacturing facility for highest quality. Stainless steel hardware and high tensile strength insulated solid copper 12 gauge wires are used to survive in severe weather applications! When you put it up, it STAYS up!